Keep cool - and do not fiddle with the knobs, until you know which knob is which! This is the golden rule for all TV set owners when distortion of one kind or another spoils the picture. But first of all, to get perfect pictures your set should be perfectly adjusted. The best guide to this is Test Card C, transmitted in the mornings by the BBC. 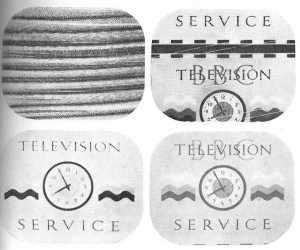 A similar evening check can be made with the Clock Tuning Signal put out before evening programmes by the BBC. On Test Card C look first for the black and white border. The border design should show evenly all round the screen. This shows that the picture is correctly positioned. If it is not, the circle in the centre of the card will not be a true circle. To correct the border, if necessary, use the Height and Width knobs - unless these have been pre-set on installation of the set. The knobs for Horizontal and Vertical Holds, if set in error wil dislocate the border design. The white vertical line on the left of the circle should be clearly defined; as should the black line on the opposite side. The squares of variable shades should all be clear, if Contrast and Brightness controls are set accurately. Use the Focus control to get the gradings on each side of the variable squares as distinct as possible. See that focus is equally good at the corners, on the diagonal stripes. When the Clock Tuning Signal is shown you will see how to apply a similar check. Now for the faults which can sometimes spoil the picture. Twisted black and white lines may appear, with distortion and wobble. In a bad case the picture may be twisted as a whole. This distortion is caused by a change in the voltage of the electricity mains. The Horizontal Hold should be changed to clear the picture, and reset again when the voltage is restored. Mains power changes can also make the picture move horizontally or vertically; or the picture may rotate, or shrink. It can usually be corrected by delicate use of the appropriate Hold knobs. A spray of white spots all over the picture usually means interference from some electrical apparatus. It may be motor traffic; domestic apparatus or tools nearby; or - and check this first! - apparatus in your own house. Sets today have a picture interference reducer, or a "black spotter", or "white spot suppressor" which minimise the white spots almost to disappearance point. A bright flash across the picture with noise in the loudspaeker is also usually caused by electrical interference. Hospital apparatus, if not suppressed at source, can produce a herring-bone pattern on TV. Radio dealers can often deal with these kinds of interference. If not, the Post Office will supply a complaint form, and action may be taken locally to advise users of apparatus to fit suppressors. These are some faults which can point to internal wear and tear, or defect. If clear focus cannot be obtained by readjustment of the Focus control and slight change of the Hold controls, and if the scanning lines are very visible, there may be a cathode-ray tube fault, or a valve defect. But any failure of focus is a job for dealer inspection, as the focus apparatus itself may need adjustment. (Top, left) Horizontal hold incorrectly adjusted. (Top, right) Vertical hold incorrectly adjusted. (Bottom, left) Too much contrast: reduce contrast, increase brightness. (Bottom, right) Insufficient contrast: increase contrast, reduce brightness. The Horizontal Hold will stop any scanning lines wobble. Any closing together of the scanning lines, or the appearance of a bright horizontal or vertical line, can mean wear and tear. The wear on a number of different internal components can cause these defects. If "ghostly" outlines appear round objects in the picture there is probably some "reflection" of TV transmission signals from some nearby metal object. "Ghosting" can be caused by a steel-built building, a bridge, a gas-holder, or even by drain pipes near the aerial lead, and metal objects such as window frames. Dealer inspection can usually diagnose the source of trouble, and can often eliminate it by aerial or other adjustment. Dark, broad lines appearing across or up and down the screen, if not eliminated by changing the Hold controls, can mean component failure, and should receive dealer attention. If a change in proportion or perspective occurs, affecting objects or people as they move about the TV picture, the picture may not be properly centred. 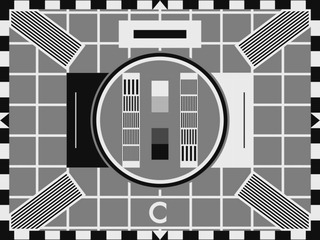 This can be checked by looking at Test Card C. If adjustment of the controls will not remedy this fault, pre-set controls or mechanism inside the set probably need dealer attention. What is called "soot and whitewash", obscuring clarity of picture and making it look flat, usually means that Brightmness and Contrast need adjustment together. Failing remedy this way, there may there may be an aerial fault requiring expert attention. The appearance of what might seem to be tiny water waves flowing down the screen, if persistent over some days, may mean interference with the vision side of the set from the sound side. The vision side can also interfere with the sound reproduction, often providing a distorting whistle. In either case only dealer adjustment can remedy matters. Many modern TV sets are treated to avoid providing interference with a sound radio set in the same house. This interference with radio listening is usually noticed as a high-pitched hum. If the set is not so treated, a dealer may be able to provide a remedy. Undue "noise" on a TV set when it is running may be due to electric mains faults, and a small addition to the internal wiring of the set will be required to obviate it. Always remember that abnormal atmospheric conditions can disrupt TV reception, especially in the summer, Thundery conditions may cause interference with the sound side, bringing in other stations, and may reduce contrast and brightness of the picture. Lightning can distort the picture. Thunderstorms with heavy lightning rarely harm a TV set, though there have been a few disasters. If the storm is near, the best way to be quite safe is to switch off and disconnect the aerial. Article reproduced from The Television Annual for 1956 edited by Kenneth Baily, Odhams Press.